During the interview, Park Shinhye kept giving out happy virus with her cute way of speaking and expressive faces. She showed her bright and healthy appeals with the role of Go Minam in the drama “You're Beautiful”, and also as “Gyu Won” in the drama “Heartstrings”. Lee Gyu Won is a college girl who suffers for the future path between gayageum and musical, and also experiences her first love. Park Shinhye provided a sense of affinity to Gyu Won. Park Shinhye plays her roles perfectly and adds her individuality to her roles. We interviewed Park Shinhye who grew up from a child actor to “the next generation Hallyu queen”. Interviewer (I): I had an interview with Jung Yonghwa ssi yesterday, and he complimented about you. PSH: He actually said the interview was fun, and he also told me that he had complimented about me. So I complained to him saying “why did you do that!? I was gonna tell your secrets!”Lol. I: Do you often call him? I: You seemed to be busy after the drama “Heartstrings”. You went to Ghana for KFHI volunteer work, right? PSH: I think it’s after “You are beautiful”, I lose my strength after I finish filming each work. I feel like dragging on the role. (It’s like I’m still in that role.) Actors often travel after they finish their filming, don’t they? I also thought I would go traveling, but then I got opportunities of doing volunteers, so I chose volunteers instead of traveling. I went to Nepal after “You are beautiful”, and this time was Ghana. After I became an honorary ambassador for the non-profit organization, 'KFHI' (Korean Food for the Hungry International), I learned once again that there are so many children who suffer from hunger. That’s why I thought I should go. I: That must have been a precious experiment. PSH: Children in Ghana are very good children. The time when I went to Ghana was the rainy season and the most affluent season that comes only twice a year. And during the other dry season, they have nothing… This time I could see children running in the green. Even though every child is so skinny without enough food, they are so bright. Seeing those children, I received big courage, and I also handed them my warm feelings. I: You said “dragging on the role.” How is it like? PSH: Both Minam and Gyuwon are very cheerful and bright. And these parts are very similar to me. That’s why I often get confused if I was Minam or Park Shinhye. Besides, when I played Gyuwon, I worked with same aged co-actors (same situation when I was Minam), so that made me more confused and dragged me on the role after a while, I guess. I: Minam’s character was like a character from a comic. In contradiction to Minam, Gyuwon was close to the reality. Did that part also appeal to you? PSH: Yes, that’s right. Minam is an ideal character, like everyone’s dream. Her job is a talent too. In the other hand, Gyuwon has a charm that people can think “Ah, there are this kind of girls. I know someone like her!” I wanted to make Gyuwon to be thought “I wanna go out that kind of girl”, “I want a younger sister like her” or “I want to be her friend”. So I tried to add a human touch to Gyuwon, and was satisfied with the character too. I: Did you reflect your personalities and habits to the character? I: Was that your usual way to walk? PSH: A… That’s not true. LOL. But I didn’t overstrain myself to walk like that. I used to get nervous in front of cameras, but I can relax these days. I became more natural than before. I think I have many ways of reaction and face expressions from the beginning, so I can naturally show reactions that fit cast mates’ acting. And that is similar to Gyuwon. I: Gyuwon often falls or slips and she’s scatterbrain. Are these parts similar to you too? I imagined that you are a meticulous person because your blood type is A.
PSH: No, I’m not meticulous. Hahaha. Since I’m so naughty, so my male co-actors often tell me I’m tomboyish. I have a girlish face too, but I always bob and weave, walk around alone and bump. So people often say “you are originally feminine, so please, please stay still”. Lol I think I have both faces. I: Gyuwon has good relationships with her father and grandfather. How about you as a daughter or a granddaughter? PSH: Same as the drama. When I went to my hometown, Gwangju, I always watched TV sitting on my grandpa’s knee and said “Grandpa～, hurry. It’s time for dinner”. When I was a child, I often placed myself between dad and mom, and let my father carry me in his arms. I still do it, not as much as in the past though. I still often follow (stick) my father. He’s very tall. When I have fights with my mother, I sometimes tell about it to my father. I: Gyuwon is the girl who majors in the Korean traditional instrument- gayageum. I heard you’ve learned how to play and got blisters on your fingers from the gayageum practices. PSH: I started learning it one month before the filming started. I practiced it three times a week. I got blisters on my fingers in the beginning, so I wore a bandage. But I took it away, since it broke the mood. I: Do you always prepare eagerly for your roles? PSH: Yes. Whatever it is, I do them thoroughly. It doesn’t matter if it’s a week, a month or year. I do it until I get fed up, and when I think it’s enough, I challenge something new. I: Did you get interests in the Korean traditional music and gayageum from this drama? PSH: I’ve always loved samulnoli (사물놀이) and traditional Korean music. On the set of “Heartstrings”, I often asked one of my seonbae in 風花("The Windflower"-Gyuwon's band) who played the gayageum with 25 strings (usually gayageum has 12 strings) to play gayageum and listened to it. I used to learn ballet before, and at that time, I wanted to learn traditional Korean dance. Everyone suggested I learn ballet, so I couldn’t learn at that time though. I: There was a scene of Gyuwon singing from the first episode. Was it a lot of pressure for you? I: This time you sang for the OST again with the song called “The day we fall in love”. Was there enough time for practice? PSH: There was little time for practice. Maybe one or two days… ? But since the production of the OST was the same as “You are beautiful” (=FNC MUSIC), and the CEO Han Seung Ho ssi knew my favorite type and style of music well, so recording went well. We also did sound check when I had vocal training. Well, I think I’m linked to FNC MUSIC by fate. The song has a good mood, but I had a hard time recording because I had a cold at that time. It’s a pity I would have done better… maybe.. I: How did you feel when you heard the recorded song? I: It was your second time co-acting with Jung Yonghwa ssi. Did he change? PSH: I thought “He has grown up” in a good sense. 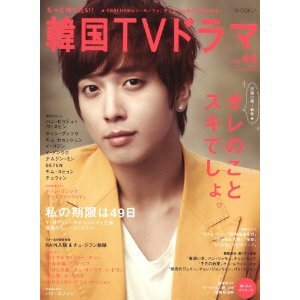 “You are beautiful” was the first work for Yonghwa, and he was a real freshman. He had a difficult time not knowing what and how to do at that time, but this time he did easily what he used to struggle. So I thought “he’s totally different from that time”. Maybe since he’s been appearing on many variety programs and shows as a singer, he has now an instantaneous force, so I thought “well, I should learn from him”. I don’t appear on variety programs at all, so I don’t have so many instantaneous forces. His attitude about analyzing and learning act have also changed a lot. I: How about his human qualities? Did they change? PSH: No, I don’t think so. Same as before. Gentle, bright and a mood-maker. I: The relationship not only with Yonghwa ssi but with Jang Keunsuk ssi and Lee Hongki ssi is still good, isn’t it? PSH: Yes. They are all my precious company. Not only I do think so, but the others think the same, I believe. At that time, we really worked as one, so we have a special relationship. Of course “Heartstrings” is the same. I: I watched NG scenes (BTS). You and Yonghwa ssi were awkward while you were filming romantic scenes. Was it hard because you two are very good friends? I: In which romantic love scene did you make NGs most? I: The scene when you two ate Ramen was very natural. Was it an improvisation (ad-lib)? PSH: Yes, it was an improvisation. There were lines in the first half, but the director didn’t say “cut” after we’d finished our lines. The camera was still filming us too. So I made him eat an egg saying “ok, you eat this egg”, and we kept acting. I: I got touched by the scene you sang crying behind the stage of the 100th anniversary performance. PSH: At that time I was feeling emotionally overwrought, and couldn’t think about other things. When I was filming tears dropped naturally. I: When I was on the set, I saw Shinhye ssi started crying as soon as the filming started. You can cry so well, but you say “I’m not good at crying act”. PSH: I started acting when I was a child, but at that time I didn’t know how to express emotional scenes well. It didn’t matter if I did how directors told me or considered by myself, I could not do well. I tended to play roles that were older than my actual age, but I didn’t know wistfulness of love or sadness of losing a loved one at all. Besides, actors have to cry beautifully, so that was hard too. I was often scolded by directors about that, so it became the trauma for me. The mental pressure like “I have to cry well”, I guess. It is recently said that “Shinhye is good at crying”, but I actually have very hard time thinking all day about that scene on the shooting day. Even Yonghwa who is always playful, doesn’t tease me on those days. I: At first Gyuwon disliked Shin, then she started liking him after she’d seen him singing. Do you also instantaneously fall in love or find someone’s appeal? PSH: It happens when I look into someone’s eyes. I think. It might be the look in one's eyes? I’m now talking facing with you (the interviewer) too, and I think it is very important. It is difficult to empathize with each other, isn’t it? I think there are surprisingly many people who talk not looking into people’s eyes. I think they are not shy (embarrassed) but not used to it. But I like to talk looking into the other person’s eyes, so for me eyes are important. I: I think normal early 20’s girls do care appearances. I: The communication among the band “wind flowers” looked very natural. Are you girls close in the real life too? PSH: Seonbaes of “wind flowers” are older than me, so they treated me kindly. They supported and cared about me a lot. I still keep in touch with Im Se Mi seonbae (the role of Bowoon), and we decided to go to a zoo with lunch boxes～! I: Gyuowon’s college-girl-fashion with long skirts, sneakers and backpacks became popular. Did you provide your ideas of styling? PSH: Stylists provided ideas, but I also joined. Our goal was “let’s make styling that are seen among real college girls!” So, I didn’t wear high heels. It’s impossible to run with gayageum in high heels, right? When I told them instead of high heels, I prefer long skirts, sneakers or loafers and backpack. I was told “girls nowadays don’t wear like that”. In the half beginning of the drama, people wondered “why is Shinhye wearing those kinds of clothes”. However, it slowly got interests and college girls imitated Gyuwon’s fashion at the end. I: You appeared with long hair late in the drama, and that was your idea, right? PSH: I wanted to show the time passage, so I thought I’d better change my hair style. Well, Gyuwon in the beginning was cheerful with wavy bobbed hair, but I wanted to make Gyuwon one year later mature. There were wistful feelings for Shin and time passages during that one year, so I decided to change the length of my hair. I: I was very worried that you had an accident during the drama filming. You returned to the set a few days after the accident, but I believe that was very hard. PSH: I felt “Oh, it’s different from how I was before the accident”. I had a hard time, because I got easily pain after I moved a bit, and my body got exhausted so fast. Since I was sitting cross-legged, I got all the impacts on my knees. So after that my feet get swollen easily if I keep standing for a long time or if I overwork. Bruises didn’t go away for a while too. That’s why I had to wear long skirts. Gyuwon’s fashions’ basic item was a long skirt, but before the accident I sometimes wore one-piece. People who didn’t know about the accident wondered “why does she always wear long skirts in such a hot summer?”. I: I believe cheers from fans encouraged you. PSH: I got lots of cheers from viewers and fans. And I was encouraged by staffs a lot. People whom I contact directly are the director and staffs at the set. They cared about me so much, so I’m still very grateful. The number of scenes of crying got increased in the late of drama. There was a day I had to film crying scenes all day on the set, and staffs prepared so well not to take long for me. I: You must have been suffered from hotness. PSH: The dramas and movies which I worked tended to start filming in winters and end in springs or start in falls and end in winters. “Cyrano Agency” (’10) started shooting in March and ended in May, so that means it had ended before the hot summer came. So it was my first time filming in the hot summer, and I thought “summer is also hard!”. It was good that we could film the day scenes for a long time in the summer, but it was sooooo hot! I: I heard the mood of the set was really good. What were the reasons? PSH: There was no one who thinks only about themselves. Things don’t go well if people think about their pros and cons a lot, but everyone from this drama was thinking others more than about themselves. Even when we made personal statements, we tried not to make troubles for others. Since the center of this drama was young casts, if we hadn’t had seonbaes’ cooperation, the situation must have been more difficult. Song Chang Ui seonbae, So Yi Hun seonbae and every other cast and staff backed up us and lead us. I think it was very hard for seonbaes too, but they worked hard silently. All the staffs were very friendly from the very first day of shooting. It’s usually awkward at the first meets. But for my surprise, when I said “good morning” on the first day of shooting, the friendly reply saying “ hi～, good morning!” came back. So at that moment, I thought “the mood of this drama is different!”. I: Would you tell us the appeals of the drama? PSH: First of all, it’s very fresh and balmy. It differs from “You are beautifull” that this drama is more realistic, and it makes you more imagine and more excited. I think everyone has memories of first love, and this story could happen to anyone. I think this drama is the drama that makes viewers totally absorbed in. There is an expression often used “viewers possess the characters (viewers start thinking themselves as if they are the characters of dramas)”. I think this drama is certainly that kind of drama, and it’s also my wish. I: After “You are beautiful”, your popularity in Asia has grown so much that you are now called “Next generation Hallyu queen”. Do you feel your popularity by yourself? PSH: To be honest, I don’t have actual feeling yet. Because, I haven’t held my own fan meetings or something like that yet. However, when I went to Ghana for the volunteer, I went there by way of Dubai, and there were some people who recognized me. That was wondering for me. By using twitter, etc, I had known there were fans in Singapore, but never imagined there were in Dubai. I realized how big the influence of “You are beautiful” is. I: You have transformed a lot since your debut. What kind of figures do you want to show in the future? PSH: Well, I feel a bit strange hearing that kind of questions. I don’t have any specific direction (category). I just let it be, and I want to show my natural figures. I’m very glad being told that I transformed naturally from a child actor to a matured actress. I think it made better that I didn’t try too hard to act grown-up. I want to continue to choose works that fit me. I want to try action, suspense and heavy soap operas too, but it’s not that easy. So I’ll take time and challenge. I: Would you give greetings for Japanese fans who cheer you? PSH: I receive many letters from Japanese fans, and messages on twitter too. I sometimes tweet in Japanese. But I haven’t had chances to talk face to face. I want to see each other soon. If it’s possible during my drama (“Heartstrings”) is being broadcasted… Please, wait a bit! I will continue to appear in works without stopping, so please look forward. Please give a lot of love to “Heartstrings” too! Thank you, ozbussi for the translation! Much appreciated! I really like this interviews thanks for share this with us.can you share the yonghwa's interviews too ......please !!!! !